That's one of my favourite! Just spring sound in it. 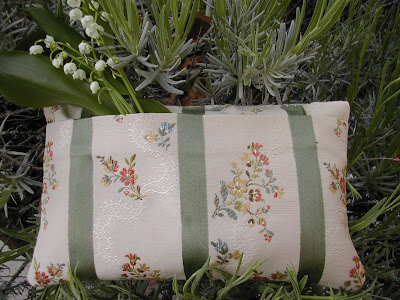 On 36ct lakeside 'lentil' and GAST .Ifinished it as a pillow with a pocket on the back, very needfull as scissor keeper or dry lavender keeper. A beautiful finish. Love th fabric on the back. Loved the look of this "pillow" both the x-stitch design and the colours. Bello lo schema, Niky, e anche la finizione a cuscinetto con dietro la tasca.